Found this dog named Cerberus at the pound the other day. Hmm… I already have three kids. This just seems like more mouths to feed. In Greek mythology, Cerberus, often called the “hound of Hades”, is the monstrous multi-headed dog that guards the gates of the Underworld to prevent the dead from leaving. Cerberus was the offspring of the monsters Echidna and Typhon, and usually is described as having three heads, a serpent for a tail, and snakes protruding from parts of his body. Cerberus is primarily known for his capture by Heracles, one of Heracles’ twelve labours. There are various versions of how Heracles accomplished Cerberus’ capture. According to Apollodorus, Heracles asked Hades for Cerberus, and Hades told Heracles he would allow him to take Cerberus only if he “mastered him without the use of the weapons which he carried”, and so, using his lion-skin as shield, Heracles squeezed Cerberus around the head until he submitted. In some early sources Cerberus’ capture seems to involve Heracles fighting Hades. Homer has Hades injured by an arrow shot by Heracles, while on the early sixth-century BC lost Corinthian cup, Heracles is shown attacking Hades with a stone. A scholium to the Iliad passage, explains that Hades had commanded that Heracles “master Cerberus without shield or Iron”. Heracles did this, by (as in Apollodorus) using his lion-skin instead of his shield, and making stone points for his arrows, but when Hades still opposed him, Heracles shot Hades in anger. Consistent with the no iron requirement, the iconographic tradition, from c. 560 BC, often shows Heracles using his wooden club against Cerberus. Euripides, has Amphitryon ask Heracles: “Did you conquer him in fight, or receive him from the goddess [i.e. Persephone]? To which, Heracles answers: “In fight”, and the Pirithous fragment says that Heracles “overcame the beast by force”. However, according to Diodorus, Persphone welcomed Heracles “like a brother” and gave Cerberus “in chains” to Heracles. 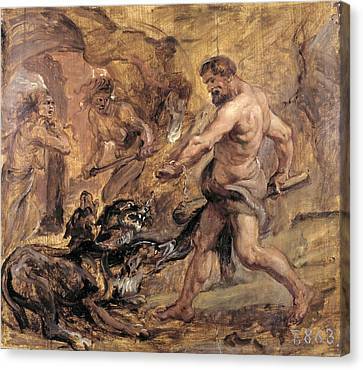 Aristophanes, has Heracles seize Cerberus in a stranglehold and run off, while Seneca has Heracles again use his lion-skin as shield, and his wooden club, to subdue Cerberus, after which a quailing Hades and Persephone, allow Heracles to lead a chained and submissive Cerberus away. Cerberus is often shown being chained, and Ovid tells that Heracles dragged Cerberus with chains of adamant. Bark more, bite like Cerberus less. More on Wikipedia.